The “January Barometer” indicator/effect is the hypothesis that stock market performance in January (particularly in the U.S.) predicts its performance for the rest of the year. There is much debate surrounding the accuracy of this indicator though. For example, the Stock Trader’s Almanac suggests that dating back to 1950, the January Barometer indicator has about a 75 percent accuracy rate while a recent article in Bloomberg/Businessweek entitled, “Investors Looking for a ‘January Effect’ Should Wait a Few Months”, studied more than 85 years’ worth of data on the S&P 500 index and concluded that the returns for the month of January correlated to the annual returns of the stock market (as measured by the S&P 500 index) just 0.30% of the time. To this end, the January Barometer was also disproven as recently as the calendar years of 2009 and 2010. 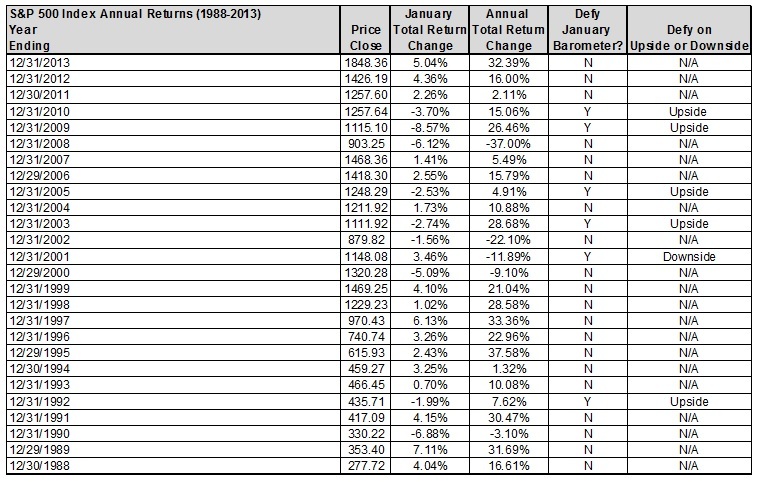 In both years, the S&P 500 index finished lower for the month of January but higher for the overall year. As a result, we, at Hennion & Walsh, decided to conduct our research to test the validity of the January Barometer effect. We collected monthly total return data for the stock market (measured again by the S&P 500 index) for the years 1988 – 2013. While some may argue that this is not a long enough time period to reach a reasonable conclusion, we would suggest that 26 years’ worth of the most recent historical annual observations is more relevant than to include older time periods where global markets were not as developed, information was not as readily available and technology not as advanced. The results of our research can be found in the table below. Data Source: S&P Dow Jones Indices, Bloomberg, January 2014. Past performance is not an indication of future results. According to S&P Dow Jones Indices, the S&P 500 index is widely regarded as the best single gauge of large cap U.S. equities. There is over U.S.D 5.14 trillion benchmarked to the index, with index assets comprising approximately U.S.D 1.6 trillion of this total. The index includes 500 leading companies and captures approximately 80% coverage of available market capitalization. You cannot invest directly in an index. Some interesting conclusions can be drawn from this data set. This was generally a good period for U.S. stock market investors as the S&P 500 index finished with a positive total return 81% of the time over this time period. The year does not start off on a positive note as many tend to believe as the S&P 500 index finished with a negative total return for the month of January 35% of the time over this time period. There is some validity to the January Barometer as it held true 77% of the time over this time period. On the flip side, it was not an accurate indicator 23% of the time over this time period. In years where the January Barometer effect was defied, it was defied to the upside 83% of the time during this time period. 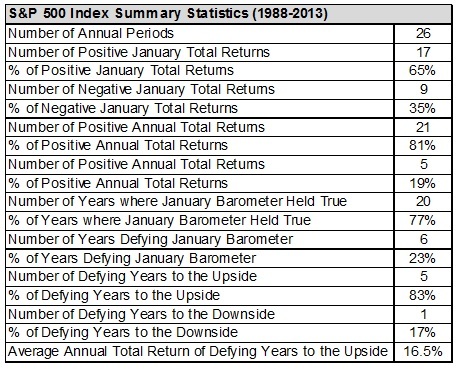 The average total return for the market in years where the January Barometer effect was defied to the upside, over this time period, was 16.5%. At this point in time, we believe that 2014 will mark the third time in the last 6 years that the January Barometer indicator/effect will be proven wrong – to the upside though once again! While the year-end total return for the S&P 500 index may not reach the average total return of nearly 17% described above under such a scenario, we do believe that a high single digit gain for the S&P 500 index overall is still realistic for 2014. Given the monthly total return of –3.46% for January of 2014, this would equate to a potential cumulative total return of nearly 12% for the remaining 11 months of the year to compensate for the initial monthly loss and reach a high single digit return such as 8% for the year.